This morning while I was waiting to renew our passports I enjoyed an excellent post from http://3acrehomestead.blogspot.com/2012/02/barred-owls.html They had captured a great picture of a barred owl, and it reminded me of how our ladies (and Flounder) deal with predators. While I don’t think that we have any barred owls, we do have a resident great horned owl. Thankfully, it is not around when our chickens are out, and to date (touch wood) we have not lost any chickens to aerial assault. While owls don’t appear to be a problem for us, Red-tailed hawks are a different story all-together. 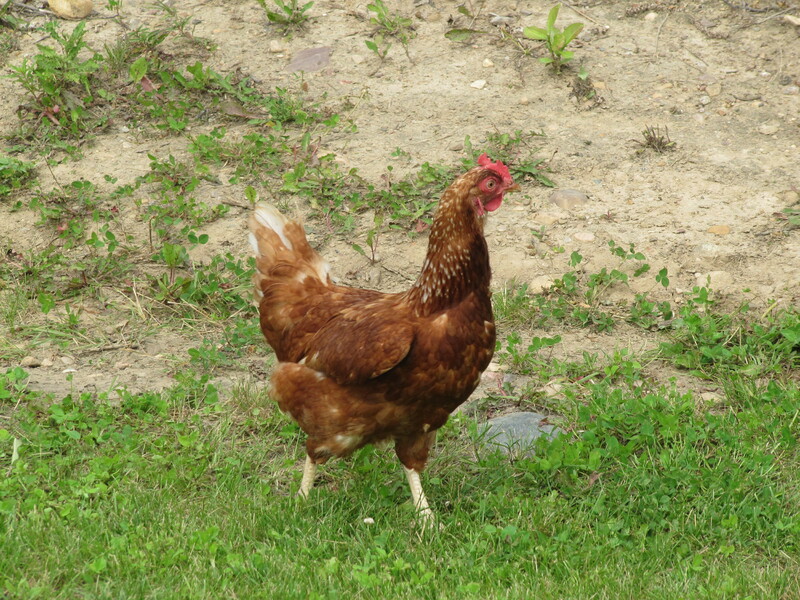 They are a constant aerial visitor year-round, and our hens stay pretty vigilant. If you have ever noticed a chicken respond to a potential attack from above, it is definitely something to remember. Being a prey animal and fairly close to the bottom of the food chain, chickens have a lot of potential predators and must remain wary. However, they are also omnivores and so must eat what they can find. Mother Nature has provided them with a somewhat unique threat detection and food detection system. Basically, one eye sees things that are close, while the other eye sees things that are far. So when chickens are scratching for goodies, they typically will step forward, scratch, step back and then look with the one eye before eating whatever interesting morsel they’ve uncovered. However in order feel safe, they must keep the other eye to the sky, so to speak. If and when they spot a threat (be it a hawk, low flying plane, or suspicious cloud formation), they freeze in spot…. After many minutes, they will slowly crank their head so that the far-sight eye is pointed sky ward…and ever-so-slowly scan to see if they have been spotted. This process can take quite some time before they feel secure once again. One of my funniest chicken-moments is looking out at the coop yard and seeing one chicken playing statue…while the other chickens are looking at her wondering what she’s doing, as they had only just come out of the coop and missed the hawk flying over. 15 minutes later…all is back to normal again!